Keep the edges of your garden neat with an edge tool. Lawn and garden edging are a core component of landscaping that completes the finishing touches by creating neat, sleek lines around lawns or plants. We stock an edge tool from Silverline that's ideal for the job. With a T shaped grip, the half-moon shaped carbon steel head can effectively cut through soil and shrubbery for a tidy border. The turnover head allows for better grip and foot pressure, enabling the tool to cut deeper. 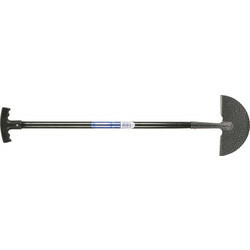 Use your edge tool to create borders between flower beds and lawns or patios and doors.